Chinese and Taiwanese Cuisine and Dim Sum on weekends. This has been a family favorite for over 30 years! We were in town for a concert at The Arlington Theater. This restaurant was close by and took reservations so we gave it a try. They did not disappoint. We got the sizzling rice soup (lots of big pieces of chicken a shrimp), Kung pao chicken (great flavor and not breaded) and sweet and sour chicken (eh, fair). We did have to request white meat chicken for an upcharge or $2 which was surprising for today’s time. The price was reasonable for the area and the service friendly and timely. We would return. Yes, it is always the same, predictable and easy to make a reservation. Parking is excellent. Would love to see some new dishes or perhaps a tasting menu. Really a good restaurant. SErvice is very attentive. It had been years since we ate at China Pavillion. 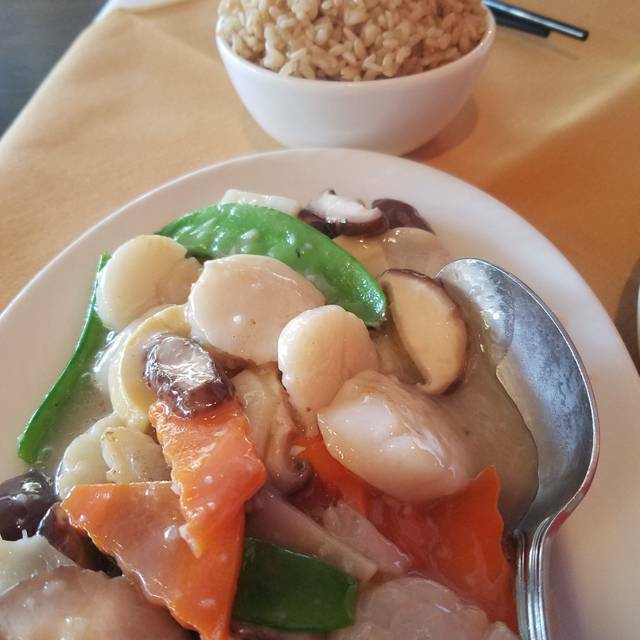 We have been searching for a good Chinese restaurant in town since our go-to spot closed. We really enjoyed our dinner and the service and attention we were given was very good. Our waiter was very professional and made the experience memorable. 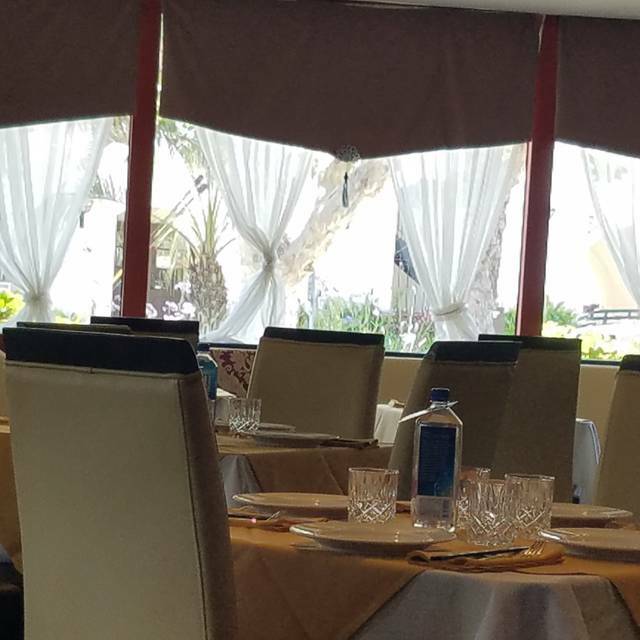 Very nice Chinese restaurant, ambience, decor, food, menu choices. Extensive menu and quality Chinese food. Traditional offerings well prepared. Excellent flavorful dishes, great service and good location with easy parking. Deserves to do well! Uneven quality, once again; this place is not very dependable. The management of this restaurant is smart - they have good employees who take care of business with appropriate service and very good, fresh tasting food. Have had many tasty meals here, the eggplant is especially pleasing, tried the small ribs in some sort of sauce - excellent. Surprisingly the cocktails here are very savoring. Have been to many restaurants in town, however the Makers Mark Manhattans are excellent and they're good about including two cherries in the drink. Reasonably priced, food seems fresh, without reeking of grease The employee at the door who assigns tables is professional. She knew how to easily process the discount coupon used for the meal. thank you. Maybe will post a picture later. We were very disappointed in our food. The last time we were here the food was excellent and this time (same food orders) it was completely tasteless. We probably won’t return. Always excellent Chinese cuisine! Great for lunch or dinner. Dim Sum on Sunday is amazing. Service seems to be almost the biggest problem here, next to the inconsistency of the food. For the 2nd visit in a row, four tables whose orders were taken after ours, were served first. We had to get up from the table to find someone to clear our empty starters plates away as the food came slowly out of the kitchen. One of the “dependable” menu items, orange peel chicken, came out tough and tasteless - all batter, no chicken, and almost impossible to chew. It is unfortunate that this is the best that Santa Barbara can provide in terms of Chinese cooking. We had a very nice family dinner. The food is tasty and the portions are just the right size to share several plates. Our waitress was very friendly, prompt and checking on us all the time! My first time there with friends. Very good food and great service! The restaurant claimed they blocked open table for the busy weekend but we made an open table reservation. Despite showing it on my cell to the hostess, she refused to acknowledge it. We eventually received a table and received the 100 points. Very odd start to our evening. Food and service very good! Great friendly service! Your hostess remembered us from visiting 6+ years ago. Food was delicious and authentic. Everyone is so polite. The service is great. We’ve gone there several times and have not been disappointed. However this time the food tasted a bit bland. We had the chicken spring rolls, Mongolian beef and pork spareribs. The pork spareribs were so tart that they were difficult to eat and also not tender. But we’ll go back and give it another try. Always enjoyable meals here - lunch or dinner. Today lunch was served fast an tasty - Singapore noodles for my husband (he found them in the Soup section of the menu), and imperial scallops for me. All orders included a cip of hot and sour soup. Jasmine tea eas brought promptly as soon as we were seated. The ambience of this restaurant is very fancy with tablecloth, quality tableware, comfortable chairs. Clean and quiet, this place is great for a private meal or business meetings, never disappointing. We had a lovely dinner here last week. We have been here many times before and always enjoyed our dinners. The tables around the perimeter are quiet with larger groups in the centers, which is great for everyone. The waiter was excellent. The Chinese food in Santa Barbara is very limited so we very much appreciate and enjoy the food at China Pavillion. Try the spicy wontons for an appetizer! We ate here on a double date before seeing a play. Great place for splitting checks and they were very quick. All the food was hot and tasty. We will definitely be back! One of the worst meals I have had there in more than 8 years and the service was the same. Santa Barbara deserves a decent Chinese Restaurant but there is not one to found between Goleta and Los Angeles. Good food but a bit pricey. Food is fresh. Hosted is vey helpful. Excellent food and outstanding service by our wait-person. He was very friendly and did his job excellently. Our dinner was very enjoyable because of him. I think they were thrown by having a wedding party later that night. This as a good Chinese restaurant--probably the best in Santa Barbara. The food is good, the ambiance better than most Chinese restaurants. I was, however, disappointed in the "mixed vegetable dish" which I order at most Chinese restaurants. It is a litmus test of the quality of the food. The salt/pepoer calamari was very good, the the noodles were good. Usually our meals have been good here. We made a mistake in ordering a dry Szechuan spicy chicken which was indelible, due to tiny little bone pieces. We mentioned this to the waitperson who asked if there were anything wrong with it. When the bill arrived, the item was on it. A restaurant that wants customers to return would have removed the item from the bill. Next time, which will be quite a while from now, we will order more judiciously. Ok, no great, don't need to return. However, I do appreciate their remodel, it is very pretty in there. The service was above and beyond! The Ma Po tofu and pan seared dumplings were delicious, and they gave large portions of everything. Glad to be able to enjoy it as leftover as well! Great food and our server was hilarious! We had a great time. Will definitely go back. 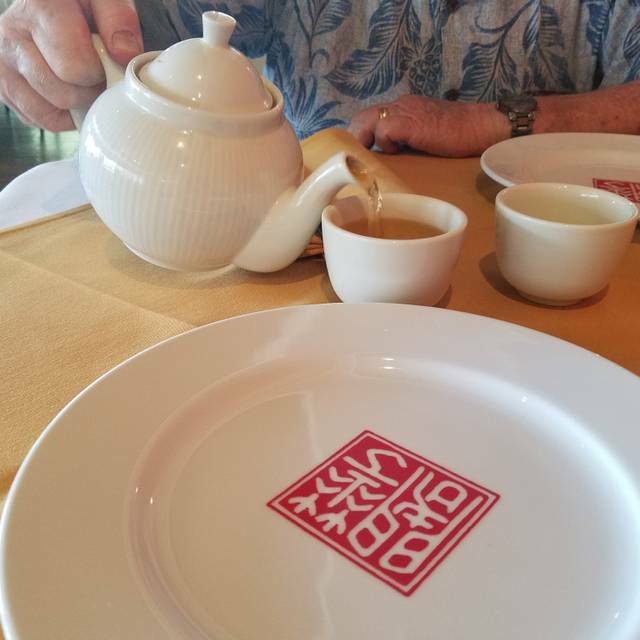 We loved the food and enjoy the fact that it had some heat; authentic Chinese. Best Chinese food I've had in years! Quality of the meats (chicken, beef & shrimp) were great & all dishes were seasoned perfectly! The restaurant was also very clean & the staff was attentive. Wish we had one close to home. This was a great dining experience especially because our clothes didn't permeate the usual Chinese Restaurant grease kitchen smell. The food was tasty and although a little pricey compared to other places, the cleanliness was a positive. The down side was although they have a municipal parking lot next door, it was full which required us to drive around for 15 minutes trying to find a space, which we found about 5 blocks away. We wouldn't do that next time, the food wasn't worth the 5 block walk. The food was wonderful , especiallyoff the special daily menu . The total bill was below what we might have expected for what we had. Our server was more professional than at most high end restaurants these days..we wanted to take him home! They have improved their decor so all was perfect.